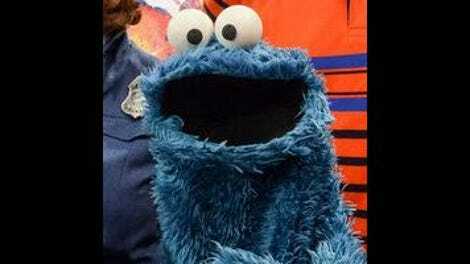 After 48 years in the business, everyone’s favorite furry blue baked goods enthusiast is having a Cookienaissance. Created for a never-aired snack-food commercial, Cookie Monster made a few minor appearances in Henson-created training films and commercials, before becoming the breakout supporting character on Sesame Street’s first season in 1969. Since then, Cookie’s unrestrained id has been a staple of preschooler’s weekday mornings, but apart from a controversial endorsement of fruits and vegetables in 2006 (in which Cookie dispensed—and then ignored—the advice that cookies are a “sometimes food”), Cookie generally took a back seat to higher-profile characters like Big Bird and Elmo. All that changed in the last few years, as Cookie starred in a string of pop-culture parodies that became Internet sensations. After years of introducing pun-filled takes on classic literature via Monsterpiece Theater, Cookie took the spotlight in viral video-ready parodies like Lord Of The Crumbs, Les Mousserables, and The Hungry Games: Catching Fur, or spoofs of last year’s Emmy nominees. So perhaps it’s no surprise that Cookie Monster has been given his first starring role in an hour-long special, airing as a standalone show in midafternoon—the preschooler equivalent of prime time. The show takes place away from Sesame Street, and in the newly opened Museum of Modern Cookie. Cookie Monster is understandably excited about the cookie-themed art, including Girl With Cookie Earring, and Starry Cookie Night. The monster’s first instinct is naturally to eat the paintings until his friends—Elmo, and human Sesame regular Chris Knowings—restrain him, and he starts to appreciate their artistic merit. Museum docent Prairie Dawn gives Cookie and friends a tour, via musical number “Me Love Cookie Art,” reminding our hero at each turn not to eat the artwork. Finally, he gazes in wonder at the most famous cookie-related painting in the world—the Muncha Lisa, by Leonardo Da Crunchi—before suspicious security guard Rachel Dratch stops him from getting too close. We then cycle through several works of art; first Cookie salivates over the painting, we flash back to Vincent Van Dough or Edvard Munch creating the work despite the help of a clumsy assistant (always Grover), while teaching a lesson about emotions or counting. After each flashback, the painting is stolen out from under Cookie’s nose, Dratch makes the obvious assumption and tries to chase him out of the museum, and Elmo plays detective and picks up clues. Eventually, divisive recent addition to the show Abby Cadabby shows up to lend an assist in catching the real culprit, and lessons are learned all around. 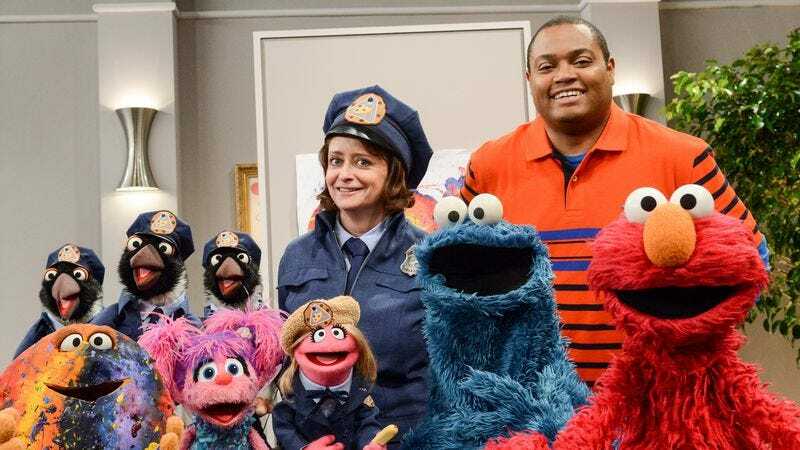 The best human Muppet costars are often the ones who can’t hide their delight to be sharing the stage with Kermit or Grover, but Dratch succeeds here by takes the proceedings absolutely seriously, keeping a stern eye on her furry suspects. It’s just a shame the story doesn’t give her more to do than that. While Cookie Thief hits favorite Sesame Street concepts like counting, near and far, loud and soft, basic emotions, self-restraint, and dealing with disappointment, not to mention some art appreciation, it’s a pretty flimsy story. The central mystery should be unchallenging to kids used to following along with Blues Clues, the songs—“Me Love Cookie Art,” “Cookie Art,” and “Make Your Own Art,”— are cute but uninspired, and the proceedings lack the wit and energy of the show’s pop culture parodies. The best Sesame material appeals to kids but works on a level parents can appreciate, but Thief falls well short of any Thomas Crown Affair references or in-jokes about the art world. The simple story and gentle repetition is more in line with toddler favorite Elmo’s World than the more sophisticated material Sesame is capable of. Thief also needs a lot of padding to fill its 55-minute running time. Besides lots of short musical interstitials, and repeated chase scenes around the museum, the story also ends ten minutes early, and is followed by a bonus section with previously aired segments—Count von Count, Abby, and Terry Crews talking about how artists create art; an OK Go music video about colors; and claymation Ernie and Bert in an art museum. One suspects a trimmed-down edit of The Cookie Thief would have worked perfectly well as the meat of a regular Sesame episode, but as a standalone story, it doesn’t hold up against the likes of Follow That Bird or Elmo In Grouchland. As for Cookie Monster, a lackluster special shouldn’t diminish his standing as a cultural icon (whether among the toddler set, or in The A.V. Club’s comment section). As long as there are cookies to be eaten, lessons to be learned about sharing, or smart pop culture parodies to be made, we’ll always have room for Cookie.